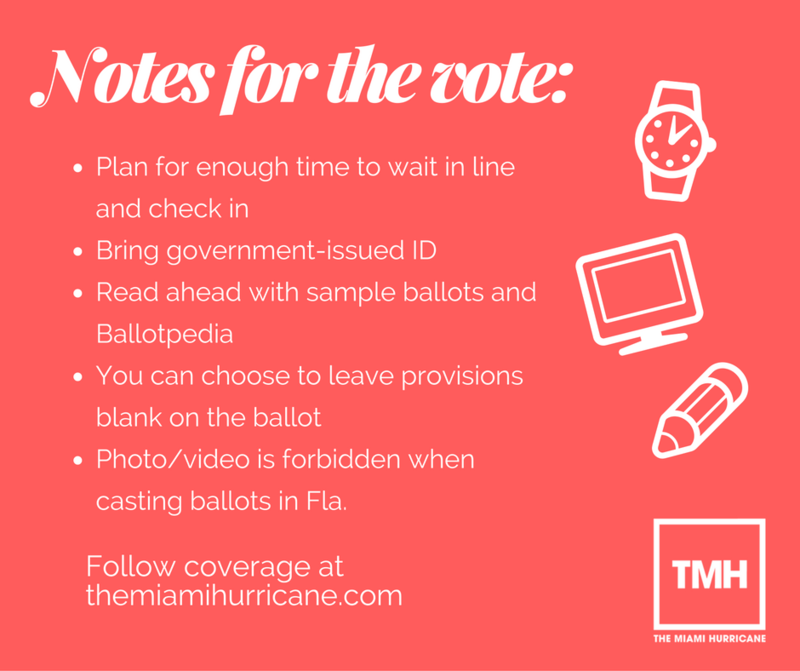 To be safe, plan to spend at least 30 minutes in the polling place. Wait times will be longer on Election Day. Bring a form of government-issued photo identification that contains your birthday and your signature. In the voting booth, be prepared and read carefully. Look at a sample ballot beforehand. For more obscure provisions, use sites like Ballotpedia and check recommendations from your local newspapers and political organizations. Voters can abstain from any provision on the ballot. In the state of Florida, any form of photography or videography is strictly prohibited in the voting booths. University of Miami’s chapter of Get Out The Vote has partnered with other campus groups to organize free transportation to early voting at the Coral Gables Library. The shuttles will transport voters to Coral Gables Library from Stanford Circle, 9 a.m. to 5 p.m. on Nov. 1 and Nov. 2.